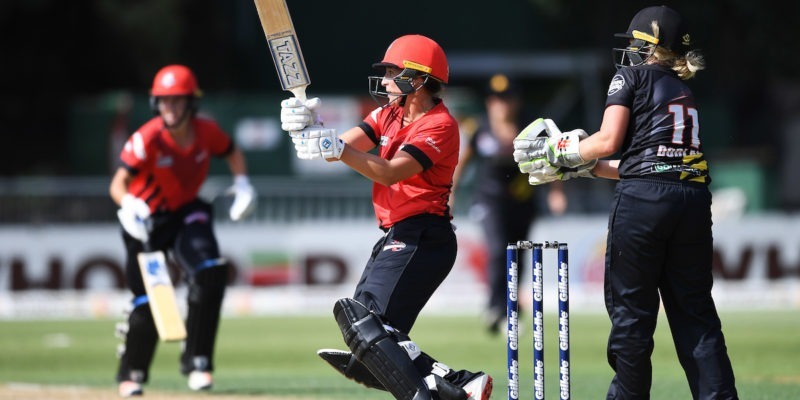 In a season that’s seen big crowds and TV audiences enjoy women’s cricket all around New Zealand, this final provided tense, high quality and no end of drama at the finish. Jessica Kerr (1-25) Sophie Devine (1-28) and Deanna Doughty (0-23) all gave nothing away – Ebrahim was caught mistiming an Amelia Kerr delivery for 38 from 38, before Bermingham cut loose, picking up six fours in her 61*, to help the Magicians scramble to 130-3. Devine hit three big sixes in the tenth over and looked ready launch – but just when some magic was needed it, Mackay provided it with some sharp fielding from her own bowling to run Devine out for 31. Burns followed, stumped by Hughes from Gabby Sullivan’s bowling for 41. With eight needed from the last over, Newton was run out by some sharp work again from her own bowling by Mackay. Then with the scores tied and one needed from the last ball, Jess Kerr pushed to the bowler and ran through. Mackay’s throw went agonisingly just past the stumps, and the title, for the second year running, was Wellington’s.